The United States has long been committed to upholding the Law of Armed Conflict (LOAC) and minimizing collateral damage, which includes civilian casualties (CIVCAS) and unintended damage to civilian objects (facilities, equipment, or other property that is not a military objective). In support of these goals, the U.S. military developed capabilities for precision engagements and accurately identifying targets, such as the development of refined targeting processes and predictive tools to better estimate and minimize collateral damage. These capabilities permitted the conduct of combat operations with lower relative numbers of civilian casualties compared to past operations. However, despite these efforts, and while maintaining compliance with the laws of war, the U.S. military found over the past decade that these measures were not always sufficient for meeting the goal of minimizing civilian casualties when possible. Resulting civilian casualties ran counter to U.S. desires and public statements that the United States did “everything possible” to avoid civilian casualties, and therefore caused negative second-order effects that impacted U.S. national, strategic, and operational interests. The United States reaffirmed its commitment to minimizing harm to the peaceful civilian population when it commenced major combat operations in Afghanistan and Iraq in 2001 and 2003, respectively. On 7 October 2001, U.S. forces began combat operations to capture Al Qaeda leadership and eliminate the use of Afghanistan as a launching point for terrorism. Within days of the start of operations, international media began reporting incidents of civilian casualties. Many of these incidents involved villages where suspected enemy were located, highlighting the challenge posed by fighting an enemy that eschews its obligations under the law of war (e.g., not wearing a uniform and hiding among the population). As a result, obtaining positive identification (PID) was more problematic, and U.S. engagements tended to rely more on self-defense considerations based on perceived hostile acts or intent. Probably the two highest profile incidents during this time were the 21 December 2001 attack on a convoy that the Afghan government claimed included tribal leaders; and the 1 July 2002 AC-130 attack on a group in Deh Rawud, central Afghanistan, that turned out to be a wedding party. In both attacks, U.S. aircraft had observed ground fire and engaged because of self-defense considerations. During major combat operations in Iraq, the ability to distinguish the enemy from the civilian population was simplified by the fact that the enemy was the Iraqi military. Iraqi forces were generally located away from civilian areas; their military equipment and uniforms reduced the ambiguity of engagement decisions relative to those faced by U.S. forces in Afghanistan. However, the Iraq military purposely violated law of war rules designed to protect the peaceful civilian population by employing human shields, misusing protected symbols for impartial humanitarian organizations (e.g., Red Crescent), and placing equipment in protected sites. In addition, Fedayeen Saddam forces did not wear uniforms and fought using irregular tactics, contributing to U.S. challenges in obtaining positive identification. In contrast, the United States and its allies went to great lengths to minimize collateral damage; for example, in Iraq, similar to Afghanistan, most air engagements used precision-guided munitions. While no Department of Defense (DOD) assessment of civilian casualties during Iraq major combat operations could be found by this author, an independent assessment judged U.S. pre-planned attacks to be relatively effective in minimizing civilian casualties. The main concerns over civilian casualties centered on coalition forces conducting time-sensitive targeting of leadership in urban areas. As insurgencies developed in Iraq and Afghanistan, the United States was forced to adopt a counterinsurgency (COIN) approach for which it was largely unprepared. With civilian protection being a central feature of COIN, the reduction and mitigation of CIVCAS became a key issue in these operations. In Iraq, noncombatant casualties were primarily caused by escalation of force (EOF) incidents, both at check points and during convoy operations. These incidents resulted in a significant outcry from nongovernmental organizations (NGOs) and the media; the shooting of a vehicle containing Italian journalist Giuliana Sgrena and her rescuers during an EOF incident further increased visibility of this issue. In mid-2005, U.S. forces in Iraq adapted and made heightened efforts, widely seen as successful, to prevent and mitigate the effects of civilian casualties. Still, this issue was not completely resolved: later in the conflict, Multinational Forces – Iraq (MNF-I) pointed to the strategic importance of reducing CIVCAS from EOF and cited the lack of available nonlethal capabilities and inadequate training in their use as key deficiencies. In Afghanistan, President Karzai made his first public statements regarding CIVCAS in 2005, asking the International Security Assistance Force (ISAF) to take measures to reduce such casualties. Initial initiatives to reduce CIVCAS in Afghanistan, such as the “Karzai 12” rules for approving operations in 2005 and the initial Commander, ISAF (COMISAF) Tactical Directive in 2007, were not successful in reducing high profile incidents. Additional efforts, including redrafting the COMISAF Tactical Directive in 2008, were made in response to several high profile, high casualty CIVCAS incidents; however, a May 2009 incident in Bala Balouk highlighted the lack of progress in effectively addressing the issue of civilian casualties. The Bala Balouk incident served as an impetus for major efforts to reduce CIVCAS by both ISAF and the United States. Since mid-2009, ISAF leadership clearly and consistently emphasized the importance of reducing CIVCAS, and ISAF modified its policies and procedures to that end. Similarly, concerted efforts on the part of the United States—spearheaded by the U.S. Joint Staff CIVCAS Working Group, currently led by a three-star general officer—aided efforts to improve U.S. pre-deployment training to better prepare U.S. forces for CIVCAS reduction and mitigation in Afghanistan. This renewed focus addressed deficiencies in pre-deployment training regarding the use of nonlethal weapons (NLWs), amongst many other efforts. Collectively, these dedicated efforts bore fruit: because of improved guidance and training, ISAF forces adapted the way they conducted operations in light of CIVCAS concerns, and ISAF-caused CIVCAS decreased over time. Importantly, analysis of available data suggested that these CIVCAS mitigation efforts were a win-win, with no apparent cost to mission effectiveness or increase in friendly force casualties. While the progress in Afghanistan is good news, to date the changes put into place have remained largely focused on supporting operations there. Sharing lessons between operations and institutionalization of those lessons are less apparent. For example, existing lessons from Iraq regarding EOF did not appear to migrate to Afghanistan, and lessons from Afghanistan regarding air-to-ground operations did not reach North Atlantic Treaty Organization (NATO) participants in Libya during Operation UNIFIED PROTECTOR (OUP). Further, a CIVCAS incident where a U.S. Navy ship engaged a small boat in the Persian Gulf and incidents regarding U.S. operations in Yemen and Pakistan (as reported in the international media) also suggest that the applicability of lessons regarding ways to minimize civilian casualties and mitigate their impact are not limited to Afghanistan. Former COMISAF, General David Petraeus, echoed this point, describing the enduring nature of the challenge of CIVCAS: “Avoiding civilian casualties is a central operational challenge in Afghanistan and Iraq and it will be a challenge in any future conflict as well.” Lessons learned in the past decade should therefore be looked at with an eye toward their application in future conflicts, as well as their continued importance to current operations in Afghanistan and elsewhere. 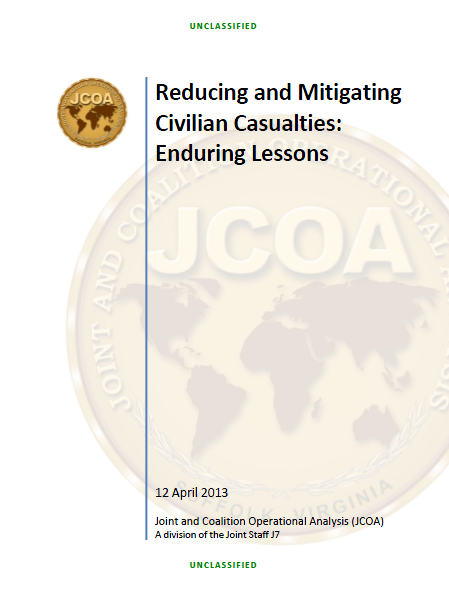 This paper identifies key CIVCAS lessons that are applicable to future operations conducted by the United States and its allies. These lessons were drawn from four years of analytic effort focused on understanding and effectively responding to the challenge of CIVCAS in Afghanistan, Iraq, and elsewhere. These lessons are not limited to COIN operations; rather, they apply to a wide range of potential combat activities, including major combat operations (in light of the political impact of CIVCAS during 1991 and 2003 Iraq wars), airpower-focused operations such as OUP in Libya, and counterterrorism operations such as the U.S. is currently conducting in Pakistan. Since each of these cases included an enemy that did not appropriately distinguish itself from the peaceful civilian population, these lessons should be particularly applicable in other, similar situations.